Hajra Waheed, Artist in Studio, Untitled (MAP), 2016. Infographic Print on Vellum, 416.6 × 62.5 cm. Image courtesy of the artist. Photo by Kaveh Nabatian. Hajra Waheed, The Cyphers 1-8, 2016. 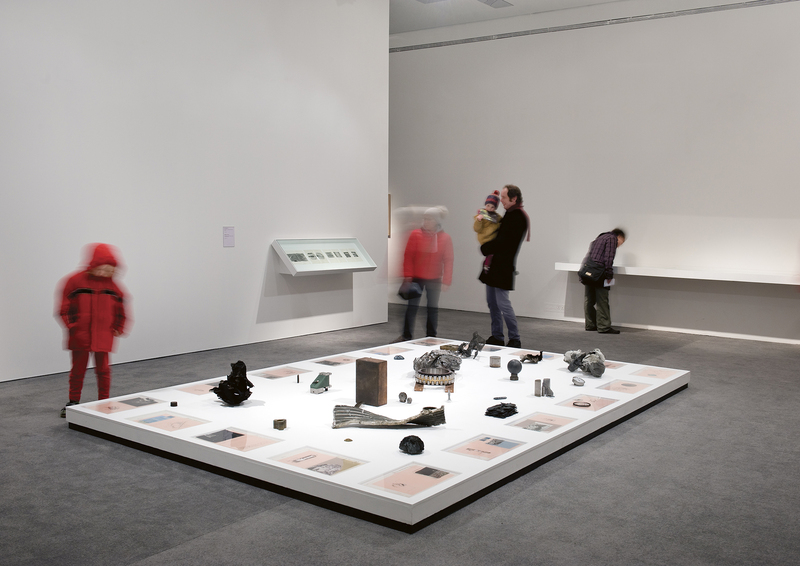 Installation View, BALTIC Centre for Contemporary Art Gateshead, UK. Image courtesy of the artist. Photo by Colin Davison. Hajra Waheed, Cyphers 1-18, 2016. 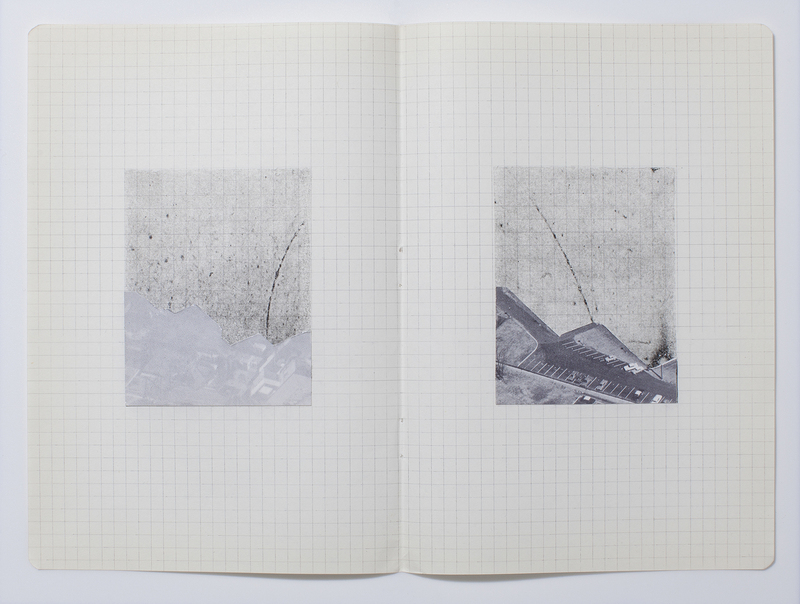 Found Objects, Cut Photograph, Xylene Transfer, Glass, Ink, Printed Mylar and Archival Tape on Paper, 24 x 43 cm (each). 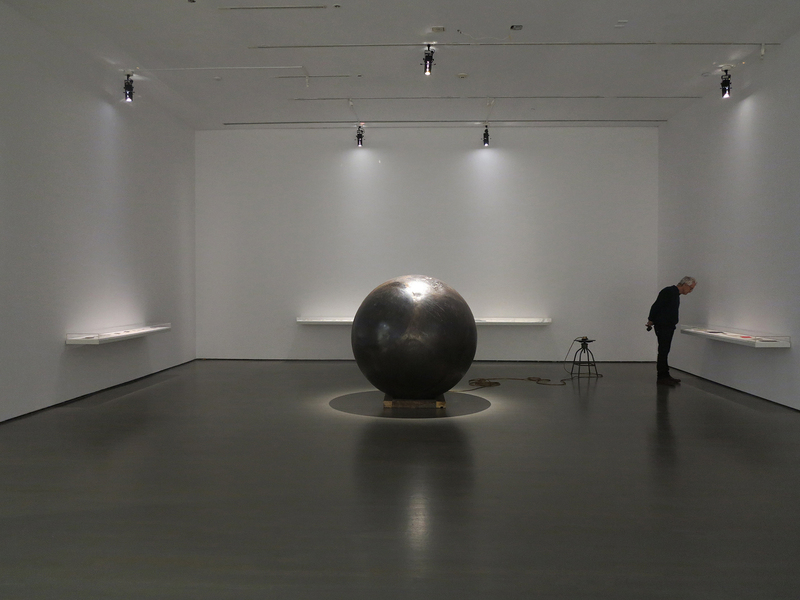 Installation View, BALTIC Centre for Contemporary Art Gateshead, UK. Photo courtesy of the artist. Photo by Colin Davison. Hajra Waheed, The Cyphers 1-18, 2016. 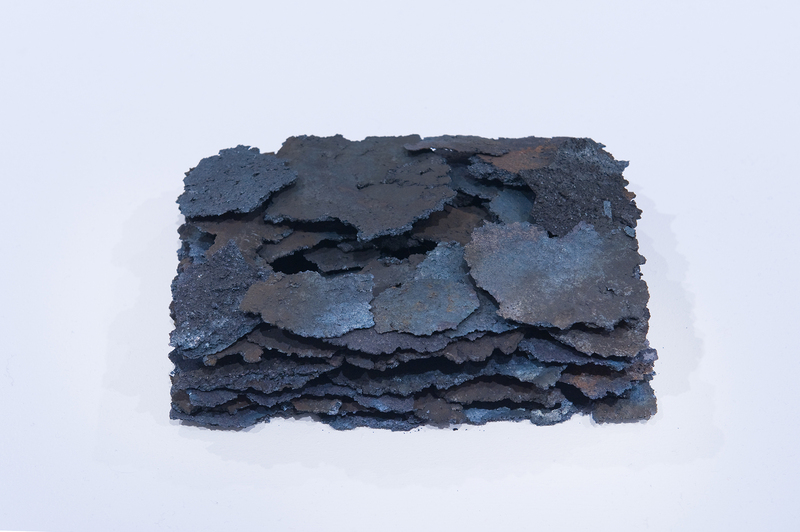 Detail, Found Object, Dross (Molten Metal Residue), 7 x 22 x 15 cm. Image courtesy of the artist, photo by Colin Davison. View of Hajra Waheed's 'The Cyphers,' 2016, BALTIC Centre for Contemporary Art, Gateshead. Image courtesy of the artist. Photo by Colin Davison. Hajra Waheed, Still Against the Sky 3/3, 2015. Etched Transfer Paper, 62.2 x 79 cm. Image courtesy of the artist. Photo by Renaud Lafreniere. Hajra Waheed, KH-21, 2014. 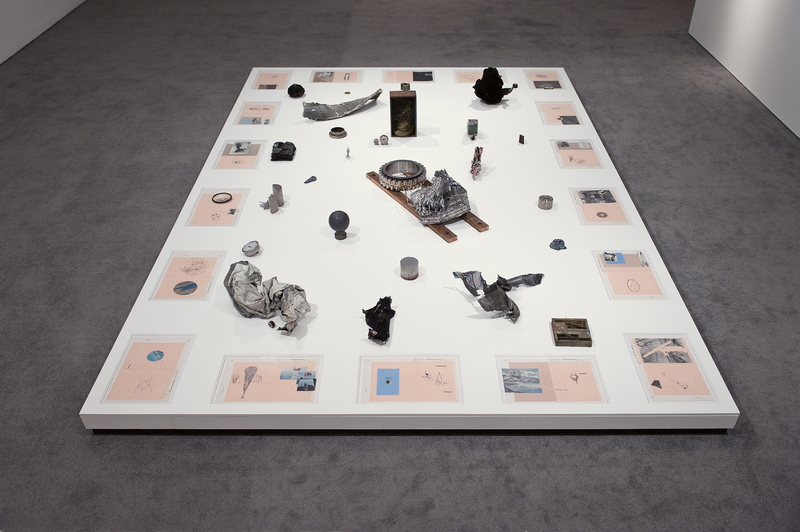 32 Unique Works on Paper and Sound Sculpture, Installation View, La Biennale de Montréal, MACM, Montreal. Image courtesy of the artist. Photo by Marc Antoine Dubois. 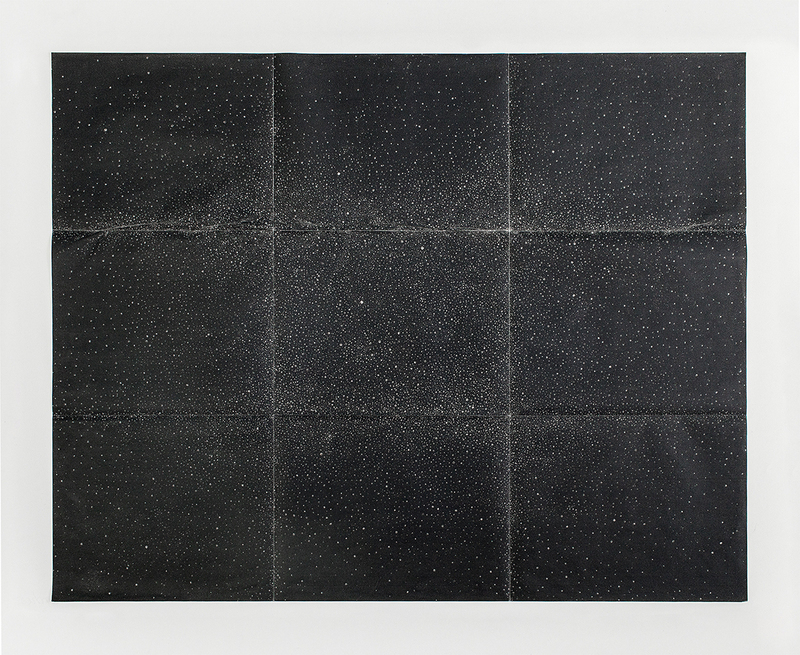 Hajra Waheed, KH-21 Notes 21/32, 2014. 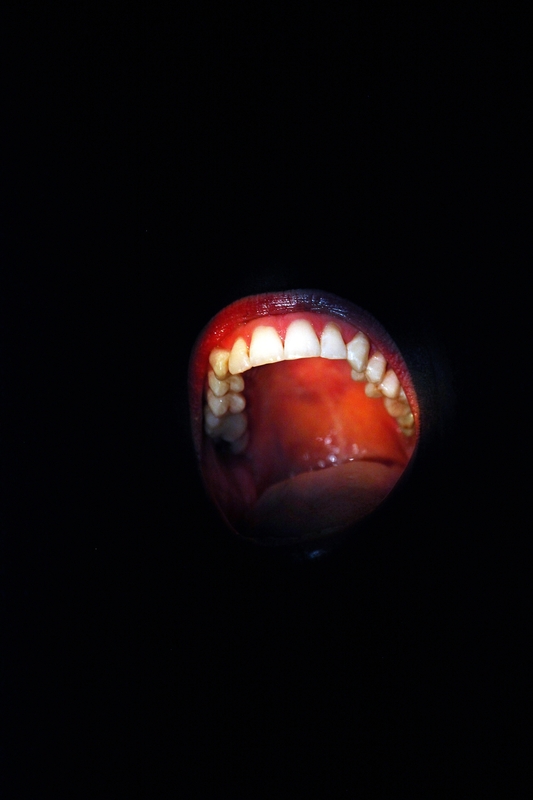 Cut Photograph & Aluminum on Paper, 22 x 30 cm. Image courtesy of the artist. Photo by Marc Antoine Dubois. Hajra Waheed, KH-21 Notes 24/32, 2014. 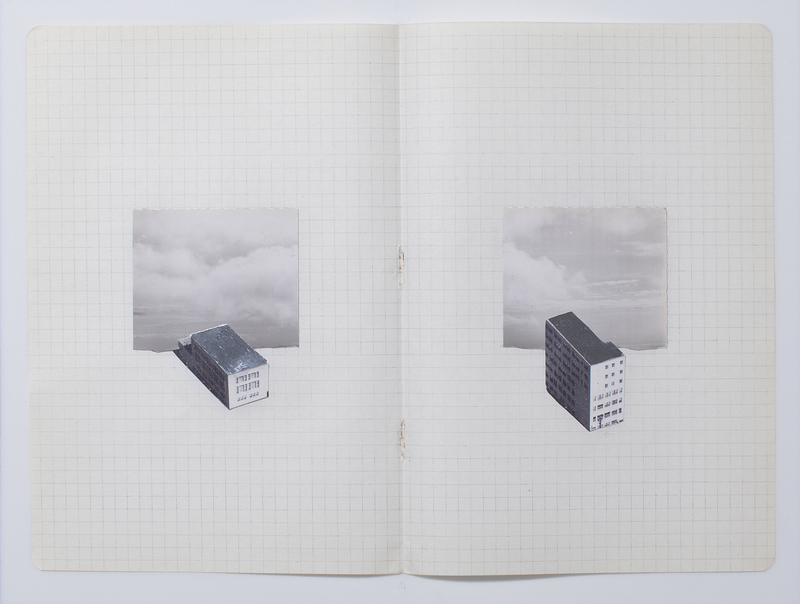 Cut Photograph, Xylene Transfer & Graphite on Paper, 22 x 30 cm. Image courtesy of the artist. Photo by Marc Antoine Dubois. 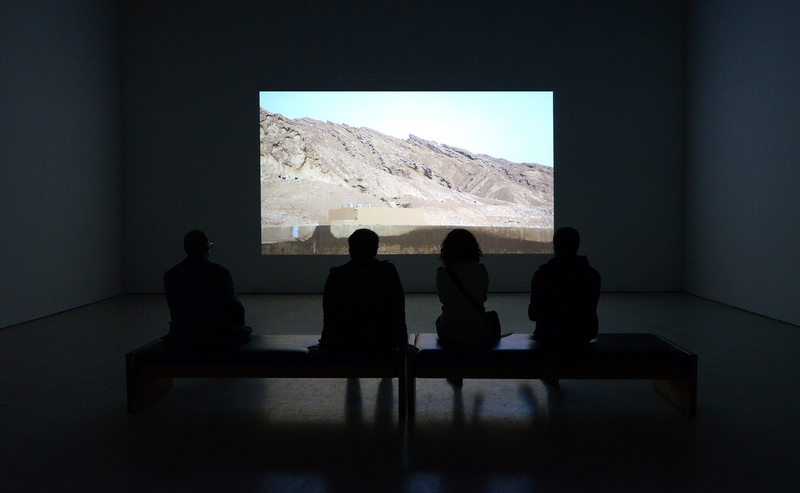 Hajra Waheed, The Video Installation Project, 2011-2013. Single channel video, 9:20 minutes. Projection View, The Wave, Field Notes & Other Backstories, Art Gallery of Windsor. Image courtesy of the artist, photo by Frank Piccolo. This conversation with Hajra Waheed began in person with an opportune meeting at her Montreal studio in April 2016. At that point she had two solo exhibitions taking place simultaneously in the UK, Sea Change (Chapter 1) at The Mosaic Rooms in London and The Cyphers at BALTIC Centre for Contemporary Art in Gateshead. It was through a past colleague at the latter, Alessandro Vincentelli, that I was first introduced to Hajra’s intelligent and materially varied practice. Describing her work as personal and fascinating, he urged me to contact her should I find myself in Montreal. While inextricably linked to personal experience, Waheed’s work also seems indicative of our wider contemporary moment. The intricate narratives woven throughout mirror a time in which it is becoming evermore difficult to identify fact from fiction, of complex power struggles both online and offline, at ground level and aerially, where tensions between social justice and rampant racism and xenophobia proliferate, and where examining and addressing power structures, ultimately, is key. 2016 was a tumultuous and unpredictable year, and one in which Waheed’s practice achieved a quiet ascent. Our conversation developed from a studio visit to an email exchange, in which time she was nominated and then shortlisted for Canada’s biggest contemporary art accolade, the Sobey Art Award. 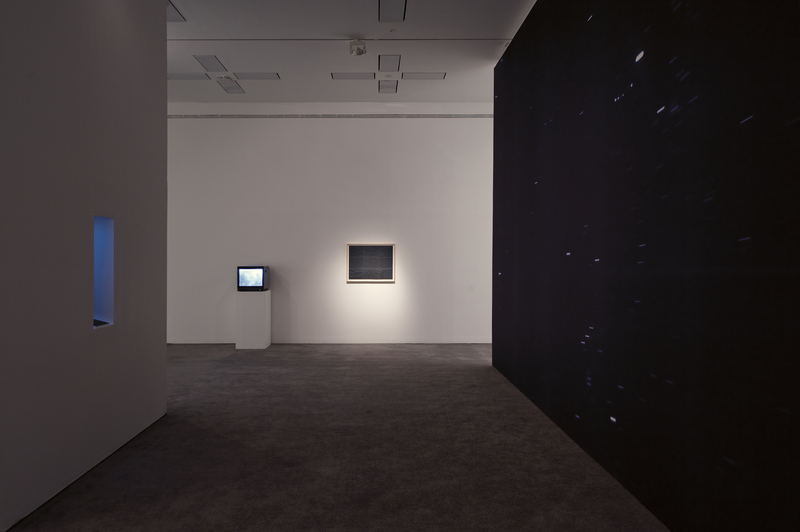 Waheed’s installation was exhibited as part of the 2016 Sobey Award Finalists Exhibition at the National Gallery of Canada, Ottawa. She also participated last year in a travelling show, curated by Tate Modern Curator/Researcher Nada Raza, at OCA Office of Contemporary Art in Oslo, Norway. A solo exhibition at ALT, Istanbul and participation in the main exhibition of the 57th Venice Biennale ‘Viva Arte Viva’, amongst other shows, beckon for 2017. — You’ve been making work, recording, since you were very young, could you talk about your upbringing in Saudi ARAMCO and how that’s affected the way you approach making artwork today? — I was raised in Dhahran within the gated headquarters of Saudi ARAMCO (Arabian American Oil Company) – my family spent 22 years there. It rests on a hilly, rocky patch of desert in the eastern province where most of the earliest productive oil wells in Saudi Arabia were drilled including Well #7 or Prosperity Well, the first commercially viable well in the country, which still flows today. Initially, Dhahran was considered a rustic camp, an all male outpost that provided Saudi and American oilmen with the bare essentials: workshops and offices in which to do the jobs they were there to do, and basic board and bed. Today, it’s often characterised as a gated corporate Levittown, arousing both the anxieties and images of a 1950s southern California suburb. Employees and their families are required to use identification cards at armed/gated check-points upon entering this 30 sq. mile radius; complete with cul-de-sacs and streets named after those familiar to the US – Spruce, Holly, Cherry, Pine, Walnut and Prairie. There are trim one- and two- story homes (identical in style) surrounded by lawns set off by hedges, trees and flowers. The community had recreational facilities and other amenities of modern North-American life in addition to two schools, designed for children of Saudi ARAMCO employees and structured in the way of a mainstream US public school system. During the years I attended, Saudis were not allowed into the school system, Arabic was not taught nor Middle East History – only US History with students given the option of choosing between French or Spanish. Most of my teachers were Mormons from Salt Lake City, Utah, Texas or Ohio. I attended Saudi ARAMCO’s schools, played in its Halliburton sponsored ball parks and its highly-secured stretches of vast desert, checked out books from its censored libraries, drove down its lush palm lined streets, constantly negotiated between its corporate regulations and the Kingdom’s Shariah laws while mediating between multiple identities and complex religious, political, socio-economic, racial and class divisions. For years, Dhahran has been protected by US and Saudi Airbases, an in-compound security force, the CIA and Saudi Secret Service with strict regulations around access and the civilian use of photographic/video equipment. This kind of secrecy and isolation became the very undercurrents that as a child influenced my play, the interests I gravitated towards and the questions I asked. I developed an obsession early on with identifying aircraft, tracking flight routes and keeping a log of my observations in a cryptic visual language. In some ways, this very language still informs my practice. 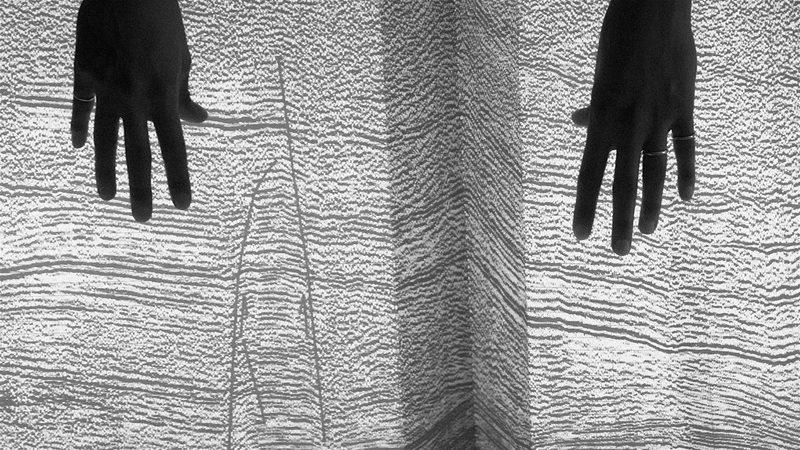 Partly due to growing up in what remains a contentious geopolitical hotspot, these early experiences have continued to guide major themes in my work, from surveillance, to the dehumanisation of the other to the examination of our current vertical occupation. I can’t help but remain preoccupied as I always have, with issues surrounding power, privilege and difference—concerns that I have deeply felt from a young age, themes that have been hugely influential to both my teaching and art practice. — What was it like to transition out of that very controlled environment? — When I was 14 years old, I was enrolled in and sent to Emma Willard School in upstate New York, the first school dedicated to women’s higher education in the United States. Our family couldn’t afford boarding school, but part of Saudi ARAMCO’s corporate regulations required that all employees’ children leave after grade nine as part of what I have come to understand as a cultural re-assimilation program. My father was given two options: leave his position as a geologist and risk being out of work indefinitely, or keep it and enroll me in boarding school, funded by the company. The transition from a Saudi oil corporation to an all-girls’ boarding school in rural New York coincided with my process of negotiating at a young age between these disparate but equally controlled gated communities. Emma Willard was a surreal, highly priviledged and largely homogenous environment —it provided me with a 90s Western feminist education in the context of a heavily monitored campus setting wherein personal freedoms were limited. As my parents remained in Saudi Arabia, I would still go back and forth. Leaving home at 14 wasn’t difficult. The biggest challenge I remember having was navigating between the bombardment of polarizing feminist ideologies. Looking back, I am incredibly grateful for the multiple perspectives I was afforded, but the labour of feeling forced by adults in my life to choose between one feminist ideology or camp and another as a teen was exhausting and limiting. They were however experiences that ended up shaping a more nuanced understanding of and relationship to power and the empowerment of women. — Having lived in Saudi Arabia, the US and Canada, how have the sensibilities and political climates of those places affected your work? And your own sense of identity? — I approach my work and process experiences from a specific subject-position that encompasses being a woman, a woman of colour with complex ties and relationships to North America, the Middle East and South Asia, born of Muslim immigrant parents. In a world formed on the bedrock of systemic racism and sexism, the importance of re-engaging with some of the global issues that infused my childhood—Cold War geopolitics, the military-industrial complex, colonial violence—remains vital to my work. So many of my lived experiences are folded into each and every one of my projects, as subtle as they may come across at times. They’ve helped me develop a more complex understanding of the world and past-present; they’ve made me crave a very different future. 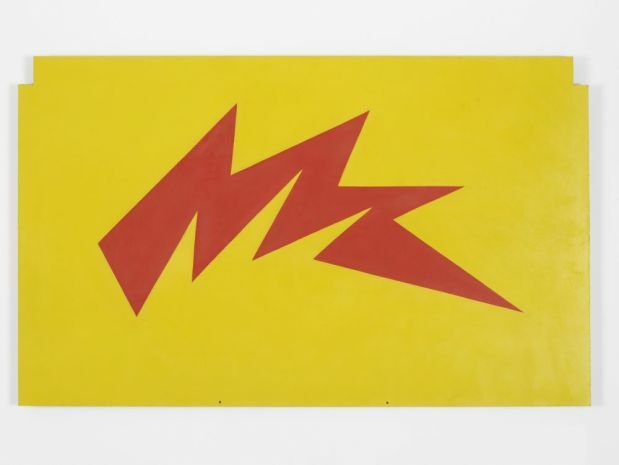 — Your works deal with complex themes – technologies, political strategy, territorial zones – but are often rendered in quite basic drawing and collaging techniques, why did you turn to that way of visualising? — Allowing objects to speak for themselves, allowing their histories to infuse one another and viewers to steep in the mystery of interconnected clues—creating just enough tenuousness or uncertainty in order to leave space for viewers to come to the work from their own perspectives and histories… these all remain urgent bottom lines for me. Similar to novels or poems, my work remains focused on the spaces in between, the intimated subtexts that allow for beautiful or ominous or moving images to materialize in each viewer’s imagination uniquely. Although the backbone of my practice has always remained works on paper, they often act as a launching pad for more comprehensive installations or long-term projects. 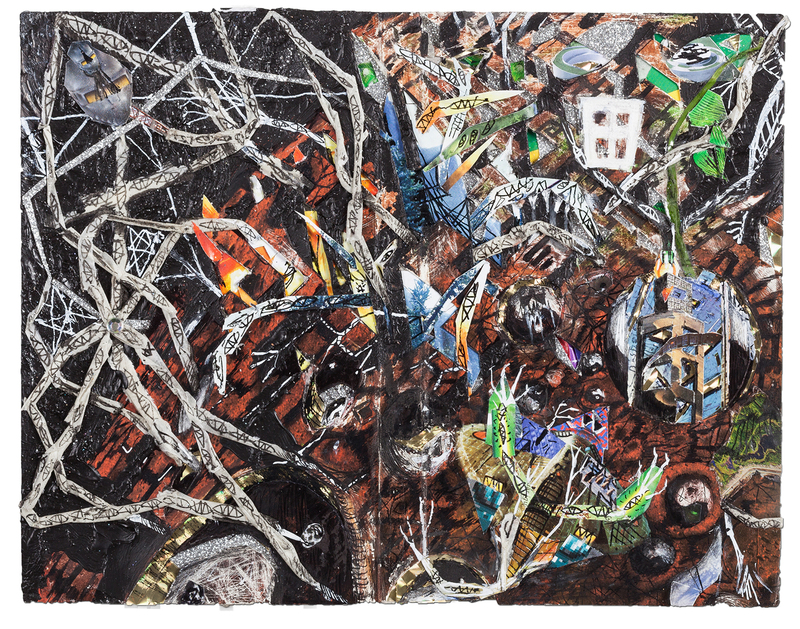 As for collage, it has an inherent potential that other mediums don’t—the potential to reimagine what already exists. — Can you describe your relationship with found material? — I was accepted to the School of the Art Institute of Chicago when I was 17 and able to attend only because I received a full-merit scholarship to complete my BFA degree. I remember sitting in on my first choice class, Photo 101 only to leave it immediately after scrolling to the bottom of the course outline which read: “Course Fees: 1200 dollars.” Across the hall was a drawing class—and a zero fee policy. All I needed was paper to draw on. And so I would head to the most obscure and back-alley stationery shops on the South and West sides of Chicago in search of kind shop owners willing to relinquish paper for free that might have been aged from years of neglect or stained by the sun in their store fronts. I can’t say I’m broke now, but years later I still search out forgotten stationery shops and bookstores wherever I travel. Found or gifted items, whether paper, historical ephemera and seemingly lost or forgotten artefacts possess an inherent familiarity—a familiarity that manifests in the false recognitions, nebulous memories and personal investments that these materials themselves tend to harbour. My process has always been decidedly analogue and I rely on the physicality of objects as vessels of experience to bring a sense of embodied history to my projects. I’ve always described material of this kind as having the qualities of a presupposed history. It’s a kind of presence that allows me to lay the foundation for a necessary examination of the past—as a means to better understand the present, in order to project into the future. — In commentary about your work the phrase ‘marginalised histories’ recurs; can you expand on what histories you are interested in? — I’ve always been preoccupied with the notion of what is lost or has gone missing, pushed out, left out or left behind. So much can be revealed at the margins—within cracks, under floor boards, from whispered stories. If there are ever questions I am looking for answers to, I’ve always tended to start here, alongside the eclipsed, the refused, the silenced, the disappeared. — In works such as ‘KH-21’ and ‘Sea Change’ narratives emerge but it is unclear to what extent they are based upon truth and can be relied upon as documentation, though they are often displayed through systems of formal ‘truth-telling’. Can you speak about the role of fact and fiction in your work? — I tend not to give the conversation around discriminating between fact and fiction much weight when it comes to my work. I feel that fact and fiction can only be provisionally defined anyway and are not useful tools for relating to the work that I make, even if this binary seems to surface often in discussion around certain pieces. It is true that I deliberately avoid communicating in a didactic way; although I often deal with declassified government reports, historical documents and research into very real political and cultural phenomena, I interpret these by way of intentionally hazy, aestheticized visual translations. This is partly as a way of exposing the flimsiness of historical objectivity and partly in order to bring something human to the work, to approach topics by way of an intimate, scaled-down sensibility. What is commonly misinterpreted about this process is the extent to which I am fabricating details or creating fictional universes. I prefer to think along the lines of the seemingly fictional—that which is not immediately verifiable as fact, but does draw concretely upon historical research, archival imagery and oral histories to fill in the blanks. Ultimately, creating clear boundaries between fact and fiction has never been necessary to my work. — The bodies of work you’ve produced to date often feel like fragments of something bigger, are you building an archive? — I see my practice as a slowly unfurling process, a chronicle or story that reveals itself over the course of a lifetime rather than within the space of one exhibition. Rather than producing discrete works or standalone objects, I prefer to think of each body of work as borderless, porous and temporally unbound—not limited to some discernible end-point. This seems to best mimic the way that histories are unwieldly, they unfold in their own time, are subjective and often messy phenomena. As for the fragmentary nature of my practice, I’m afraid I don’t know any other way of working. As abstract and at times fractured the work may seem to some viewers, those closest to me can read all of it as a direct reflection of my experiences past and present—as a constellation of visual material that culminates closest to a diary than anything else. This is why I hesitate to say more than I do about certain bodies of work, perhaps this is why I also shroud my work in the lives of “characters” and leave a certain sense of ambiguity in the oral histories I explore. None of them are fictional, although it tends to be written about as such. For now, I’m ok with that. is an British writer, editor and curator, currently based in Toronto, Canada. This article is an online exclusive from February 2017.